MIDLAND — The condition of Michigan’s roads and bridges have been a constant concern among residents and rightfully so. Not only are roads essential to Michigan’s economy, moving $860 billion in freight annually, but they are a top concern of voters too. A newly released study from the Mackinac Center for Public Policy analyzes the quality of Michigan’s roads and makes recommendations for how to improve them going forward. The study, authored by Dr. Chris Douglas, chair of the economics department at the University of Michigan-Flint and member of the Mackinac Center’s Board of Scholars, analyzes the most recent data on road quality, describes how roads are funded and makes recommendations for the future. When examining the quality of the roads, the study found that overall, the conditions of Michigan’s roads may not be as bad as they appear or as they are commonly portrayed. However, the quality of the roads tends to vary depending on their type. For instance, nearly half of the city and village roads examined were in poor condition, and the same goes for county roads. But 75 percent of trunkline roads, state roads that have an “I,” “US,” or “M” in the name, were ranked as being in fair or good condition. This is important, considering these are the roads that carry nearly 75 percent of the state’s truck and commercial traffic and over half of the passenger traffic. The challenge for these roads is that they are projected to deteriorate in quality over the next several years, so continued investment is still needed. 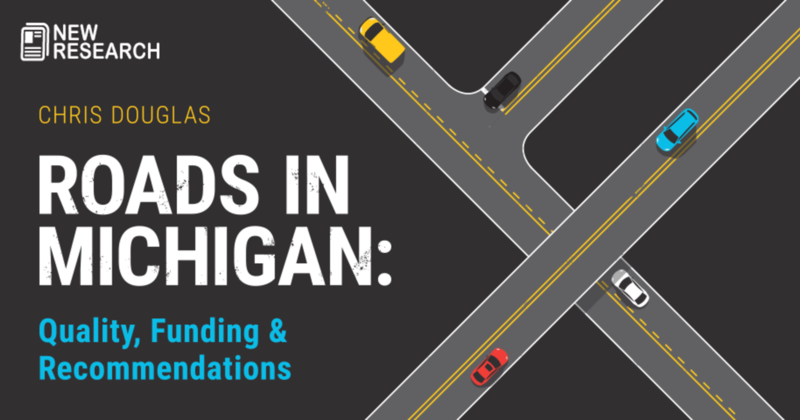 The study also takes an in-depth look at how road funding, mostly generated by fuel taxes and vehicle registration fees, is distributed to the Michigan Department of Transportation and local governments. Douglas finds that there are several ways this funding mechanism could be improved, to better deliver resources where they’re needed most. The study recommends that Michigan stick as closely as possible to a “user fee” model of funding for roads. Douglas argues that drivers should pay in taxes and fees an amount that’s roughly equivalent to the cost of repairing the damage that their vehicles cause the roads. Based on standard economic theory, that’s the most efficient and fair way to fund a public good like roads. You can view the complete study here.